It was in the middle of a dinner rush at an upscale restaurant I was a chef at as I worked my way through college. My chef’s knife was sliding across the counter and falling to the floor. I immediately reached out and caught the handle of it before it hit the ground and kept working at a steady pace. I know there is a risk of getting hurt trying to catch a falling knife, but it was an easy one to grab — the blade was down, it wasn’t spinning and the handle was only a foot away. If you try to catch a falling knife in the stock market, you’ll get the same crazy look from most people — they wonder why you would take that risk. But not every falling stock is a “falling knife” stock, and you can pick the best to take advantage of. That’s why you should look at catching falling stocks the same way I did with the falling knife — only grab the ones with the best opportunity of success. The unloved sector at the moment is master limited partnerships (MLPs). Recently, there was an announcement that disrupted the status quo for a large part of the industry, and that helps present us with our opportunity today. According to FactSet, MLPs have reached a valuation this low twice in the past decade, in November 2008 and February 2016. After each occasion, MLPs overall rallied 50% and 60%, respectively — and today presents another chance to catch a 50%-plus gain. Let’s talk about what type of companies are typically an MLP. While it is a unique classification for a company, it can carry tax benefits with it that certain companies benefit from. That’s why basically all MLPs are in the oil and gas industry — either refining, marketing, storing or transporting the commodities. That makes them all tied to the price of oil. And right now, oil is climbing higher. But MLPs are not benefiting from higher oil prices yet. Well, the answer is simple — it takes time. When oil prices plunged, production was cut at around the globe. Exploration was halted. Companies benefiting from those projects eventually plunged. They didn’t react immediately, though. As you know, the price of oil changes daily. To reduce that type of fluctuation in projects, the market operates in contracts, which lock in the prices. It takes a year or two for those projects to roll out of their contracts, and new projects show the effects of price changes in oil. Hence, part of the reason why oil has rallied, and MLPs have lingered. This will create more than enough of a tailwind to offset the slow rise in interest rates that investors seem to be concerned about. 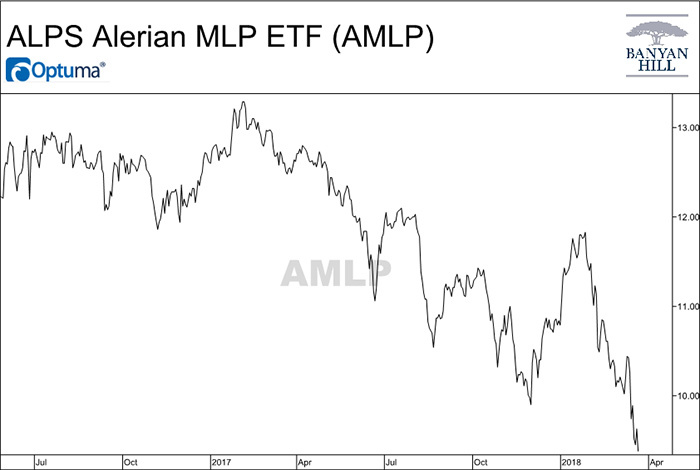 That’s why the latest hiccup for the industry will be the attention it needs to bounce higher, and there’s a simple way to benefit — buy the Alerian MLP ETF (NYSE: AMLP). What created the recent volatility was a change to the accounting standards for a specific group of MLPs. The Federal Energy Regulatory Commission said some MLPs could no longer use a certain tax allowance. The company went on to explain how rates are negotiated. Many of its rates are set by negotiations, so it can incorporate the changes going forward with minimal impact. And keep in mind, only certain companies are even impacted — interstate pipeline companies. The other industries like refining and storage, etc., are not impacted by the announcement, and intrastate pipeline companies are not affected either. Yet the entire MLP sector plunged on the news, and that’s why it gives us an opportunity. The Alerian MLP ETF holds 26 MLPs inside of it. The current yield on the exchange-traded fund is a massive 8.8% — more than four times the average 1.8% yield a stock in the S&P 500 pays. Even if the sector remains in its current downtrend, the ETF could pop to nearly $11 — 14% above the current price. Now, if the tide is turning for the sector as I described above, with more projects coming online, higher gas prices and overall more money being thrown into these companies, then this ETF is set to climb to $15 a share — a 55% gain from its current level. Regardless, this “falling knife” is worth trying to catch, and now is the time to jump in.